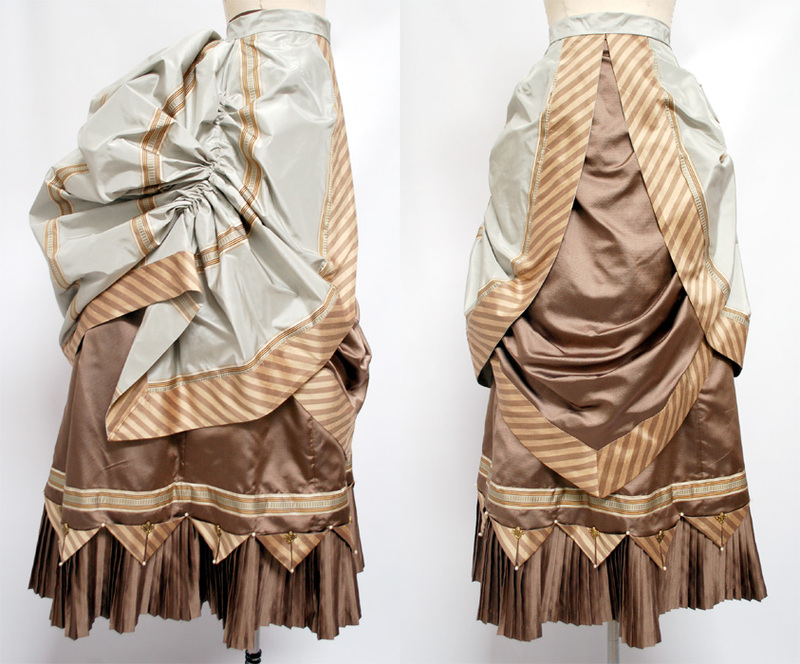 Home » 1880s » >Bustle Dress Progress- We Have Pleats! >The underskirt and overskirt are nearly done! All they really need are hooks and eyes and button on the inside (and pressing, which I didn’t really do before taking these pictures). Then on to the bodice! I had a bit of a problem with my pleats. Initially I wanted to double them up, so the foldline would be the hem and then it would be weightier, since the fabric is very light. I pulled out my Perfect Pleater, but the pleats just would not take! Woe! So I ended up giving it 1/2″ hem allowance and using black lace seam tape. The pleats took just fine after that with a mixture of vinegar/water for spray, the Perfect Pleater, and a scrap of muslin for pressing. They’re now nice and crisp :). I found the secret to getting mine to hold better is to wait until they’re completely cool before removing them and going on to the next length. It took quite a while, but I just spaced it out over a day and it worked out fine. To attach the pleats I first bound the edge of them with bias tape, then pinned around the length of the skirt, put it on the form and checked the length, then hand sewed them to the skirt. 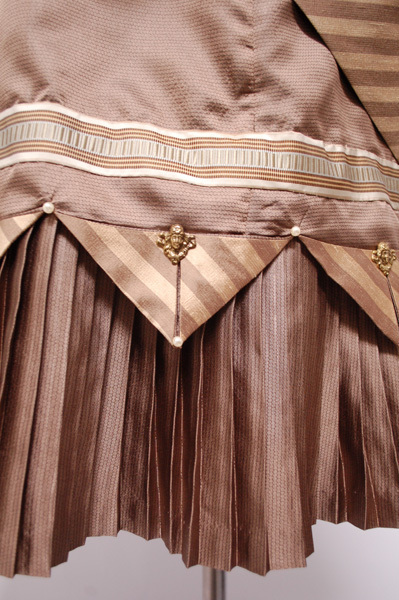 The row of stripe for trim is covering where they were attached, so you can’t see through on the outside. A plus to doing it this way, as I thought of afterward, is that if I ever need to change out the pleat (if it’s stained or dirty or I want to make this work for another gown), all I have to do is make another set of pleats or ruffles and remove my hand stitches and put another one in it’s place. Nifty, huh? The bodice is next! But first I have to concrete what I want to do! I only have a few strips left of the brown, maybe 1/2 yard of the stripe, and maybe a yard of so of the blue so it’s time to get creative. Right now I’m thinking of combining the front of this Truly Victorian bodice with the back of this Truly Victorian bodice, neither of which are from the Late Bustle period, but I won’t let that stop me. Hehe. I’ll have to get the patterns out and see if it would work or if it will be a lot of hassle (and if I would have enough fabric) before I make up my mind. Then it’s time for a mock up! Is anyone else ridiculously excited for the Royal Wedding tomorrow? 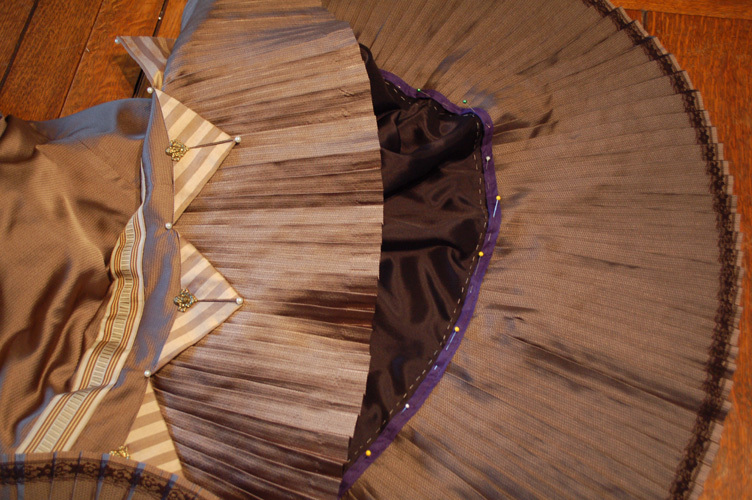 April 29, 2011 | Comments Off on >Bustle Dress Progress- We Have Pleats! « >Can you help me? What is the Origin of this Vintage Ensemble?